I usually disagree when people tell me I resemble this or that character, but for some odd reason I really felt a connection to Hiro. I felt it with the particular way he expressed things with his eyes, that button nose, uneven teeth, thin lips, the long oval face shape, and the slight underbite. This is really dorky of me, but something that kinda floored me though was the similarity I saw in our teeth. (Not the tooth gap, though — that I had to add mine on with tea leaves/toasted seaweed/a sliver of fabric stuck with dental glue.) But the general shape of our front teeth, and the manner in which the teeth directly adjacent are nudged upwards a bit. Incredible. 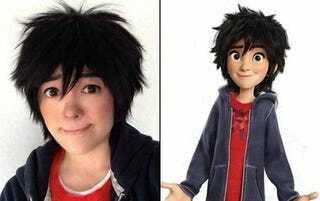 This is real-life Hiro.